Peach is a petty and delicious fruit that is low in calorie and enriched with vitamins and minerals. Raw peach juice is packed with minerals like iron, manganese, zinc, calcium, magnesium and sulphur. It also contains Vitamins like A, B1, B2, B9 and C. Even though you can eat it as a fruit and it is very delicious, a single serving of peach juice allows body to absorb more nutrients. By drinking peach juice, your body will be able to absorb more nutrients rapidly. This way it helps in improving your overall health, increasing the immunity power and protecting your body from various types of diseases. So, consume peach juice and have a healthy body. How to make Peach Juice? Making peach juice is very easy. Cut the peaches in half and drop the pieces into a blender. Now add water, lime juice, sugar and ice cubes. After blending you can put the juice into a jug and store. You can also pour it directly into the glasses and serve immediately. You can drop some ice cubes and garnish with peach slice and mint leaf. Since peach juice is low in calorie, you can consume it without any worry if you are on a weight loss programme. It can cut the flab and make you slim and trim. 100 ml of peach juice contains only less than 57 calories. So, if you are on a weight loss programme and bored with the bland food that you consume daily, try peach juice. Peach juice is known for its anti-inflammatory and anti-oxidant properties. It can provide you relief from swellings, joint aches, as well as inflammation. It has the ability to fight against the free radicals that can damage your skin and helps in keeping your skin looking younger and radiant. Peach juice is a natural diuretic and laxative agent. This makes it very effective for improving the kidney and bladder functions. By consuming this juice regularly, you can lower the chances of you suffering from nephritis, other renal diseases and liver problems. Peach juice is also good for dissolving kidney and bladder stones. As peaches contain vitamins and minerals in high quantities, peach juice is good for giving a boost to your immune system and protects your body from cold, and other diseases. Drinking peach juice regularly makes you less prone to common ailments and disorders, including seasonal and chronic. It can help in treating chronic coughs and bronchitis. All you have to do is to drink tea made of the leaves and bark taken from the peach tree. Peach juice is alkaline in nature and this makes it great for providing you relief from symptoms connected with indigestion, constipation, gastritis, nausea, flatulence and other conditions associated with digestion. Peach juice is considered as a good natural remedy for stomach ache. It can also de-worm the individual by cleansing the intestinal tract. Peach juice is good for cleansing the intestinal tract and also improves the functioning of the kidneys. The presence of fibre in it in high amounts helps in removing toxins from the body. Because of the ability of peach juice to cleanse the body, it is great for improving the quality of skin and hair. It provides volume and softness to your hair and also imparts a clear complexion to your skin. So, make sure that you consume peach juice regularly. Peach has the ability to prevent cancer and reduce the risk of macular degeneration. This is because of the presence of lycopene and lutein in peaches. It is true that peach juice cannot combat cancer once it sets in your body. But by consuming peach juice regularly you can prevent cancer from manifesting in the body. Consuming peach juice regularly is good for making your heart muscles stronger and for increasing the flow of blood to all parts of the body. As a result, the blood pressure and cholesterol levels in the body are lowered. Peach juice is very effective for preventing the risk of atherosclerosis, myocardial infections and most of the cardiovascular diseases. Peach juice is also a rich source of iron. So, people suffering from anaemia are greatly benefited by drinking peach juice regularly. Peach juice is effective for improving your eyesight because of the presence of beta carotene in it. The juice helps in improving the blood circulation to ten eyes and the muscles surrounding the eyes. This way it helps in preventing loss of vision due to weakness of the muscles. Having a skin like peach is a compliment that can make anyone happy. 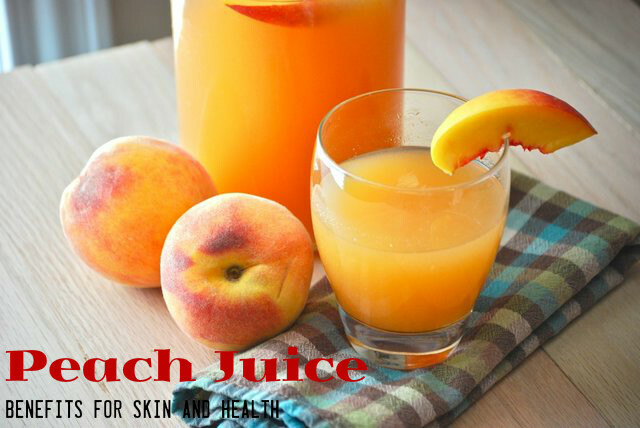 Peach juice is one of the best for your skin. It is considered as one of its major health benefits. It is rich in vitamin C and this makes it an important ingredient in many of the skin products that you get. It has the ability to improve skin tone, texture and the quality of the skin. You can also apply peaches directly on the skin as face mask or face pack. This helps in getting rid of spots on the skin, dark circles, blemishes, scars, pimples and acne. So, use it regularly to get a glowing and blemish free skin. Peach also has sedative properties. Boil water and peach flowers in water and add some honey. This can cure restlessness and keep you calm. So, make it a practice to consume one glass of peach juice daily. This will keep you healthy and looking beautiful.